In Richard Westall's Sword of Damocles, 1812, the boys of Cicero's anecdote have been changed to maidens for a neoclassical patron, Thomas Hope. For the Athenian orator, see Democles. For other uses, see Damocles (disambiguation). Damocles (/ˈdæməkliːz/; Greek: Δαμοκλῆς, translit. Dāmoklē̂s, lit. 'fame of the people') is a figure featured in a single moral anecdote commonly referred to as "the Sword of Damocles," an allusion to the imminent and ever-present peril faced by those in positions of power. Damocles was an obsequious courtier in the court of Dionysius II of Syracuse, a 4th-century BC tyrant of Syracuse, Sicily. The anecdote apparently figured in the lost history of Sicily by Timaeus of Tauromenium (c. 356–260 BC). The Roman orator Cicero may have read it in the texts of Greek historian Diodorus Siculus. He used it in his Tusculanae Disputationes, 5. 61, by which means it passed into the European cultural mainstream. According to the story, Damocles was pandering to Dionysius, his king, and exclaimed to him that Dionysius was truly fortunate as a great man of power and authority, surrounded by magnificence. In response, Dionysius offered to switch places with Damocles for one day so that Damocles could taste that very fortune firsthand. Damocles quickly and eagerly accepted the king's proposal. Damocles sat down in the king's throne surrounded by every luxury, but Dionysius, who had made many enemies during his reign, arranged that a huge sword should hang above the throne, held at the pommel only by a single hair of a horse's tail to evoke the sense of what it is like to be king: though having much fortune, always having to watch in fear and anxiety against dangers that might try to overtake him. Damocles finally begged the king that he be allowed to depart because he no longer wanted to be so fortunate, realizing that with great fortune and power comes also great danger. King Dionysius effectively conveyed the sense of constant fear in which a person with great power may live. Cicero used this story as the last in a series of contrasting examples for reaching the conclusion towards which he had been moving in this fifth Disputation, in which the theme is that having virtue is sufficient for living a happy life. Cicero asks, "Does not Dionysius seem to have made it sufficiently clear that there can be nothing happy for the person over whom some fear always looms?" The sword of Damocles is frequently used in allusion to this tale, epitomizing the imminent and ever-present peril faced by those in positions of power. More generally, it is used to denote the sense of foreboding engendered by a precarious situation, especially one in which the onset of tragedy is restrained only by a delicate trigger or chance. Shakespeare's Henry IV expands on this theme: "Uneasy lies the head that wears a crown;" compare the Hellenistic and Roman imagery connected with the insecurity offered by Tyche and Fortuna. The Roman 1st century BC poet Horace also alluded to the sword of Damocles in Ode 1 of the Third Book of Odes, in which he extolled the virtues of living a simple, rustic life, favouring such an existence over the myriad threats and anxieties that accompany holding a position of power. In this appeal to his friend and patron, the aristocratic Gaius Maecenas, Horace describes the Siculae dapes or "Sicilian feasts" as providing no savoury pleasure to the man, "above whose impious head hangs a drawn sword (destrictus ensis)." The phrase has also come to be used in describing any situation infused with a sense of impending doom, especially when the peril is visible and close at hand—regardless of whether the victim is in a position of power. The American president John F. Kennedy compared the omnipresent threat of nuclear annihilation to a sword of Damocles hanging over the people of the world. Soviet First Secretary Nikita Khrushchev wanted the Tsar Bomba to "hang like the sword of Damocles over the imperialists' heads". Woodcut images of the sword of Damocles as an emblem appear in sixteenth- and seventeenth-century European books of devices, with moralizing couplets or quatrains, with the import METUS EST PLENUS TYRANNIS (literally, "Fear is plentiful for tyrants", i.e., "A tyrant's fear is complete fear" — as it is the tyrant's place to sit daily under the sword). A small vignette shows Damocles under a canopy of state, at the festive table, with Dionysius seated nearby; the etching, with its clear political moral, was later used to illustrate. The sword of Damocles appears frequently in popular culture, including novels, feature films, television series, video games, and music. ^ a b c Cicero. ^ Jaeger, Mary (2002), "Cicero and Archimedes' Tomb", The Journal of Roman Studies, 92: 49–61, esp. 51f. ^ "Damocles", Benet's Reader's Encyclopedia, 1948, Evil foreboded or dreaded . ^ Shakespeare, William (1597), "Part II", Henry IV (online quotation in context), UK: Phrases . ^ Chaucer, Geoffrey (1475), The Canterbury Tales (online quotation in context), UK: Florida State University . ^ "Carmina (Horatius)/Liber III/Carmen I - Wikisource". la.wikisource.org. ^ Kennedy, John Fitzgerald (1961-09-25). "Address Before the General Assembly of the United Nations". Selected Speeches. Columbia Point, Boston: Presidential Library and Museum. Archived from the original on 2011-08-04. Retrieved 2011-08-05. Today, every inhabitant of this planet must contemplate the day when this planet may no longer be habitable. Every man, woman, and child lives under a nuclear sword of Damocles, hanging by the slenderest of threads, capable of being cut at any moment by accident or miscalculation or by madness. ^ Isaacs, Jeremy; Mitchell, Pat, eds. (1998), The Cold War (DVD)|format= requires |url= (help), CNN . ^ Some examples online: La Perrière, Guillaume (1553), Morosophie, Glasgow U, emblem 30 ; Paradin, Claude (1557), Coelitus impendet [It hangs from Heaven], Devises heroïques (in Latin), Glasgow U ; Boissard, Jean Jacques (1593), Emblematum Liber, Glasgow U, emblem 45 . ^ Hollar, Wenceslaus (n.d.). Emblemata Nova. London. ^ Hobbes, Thomas (1651). Philosophicall Rudiments concerning Government and Society. London. ^ Pennington, Richard (1982), A Descriptive Catalogue of the Etched Work of Wenceslaus Hollar, 1607–1677 (450), Cambridge University Press . ^ For example: Literature: Wodehouse, PG (1963), Stiff Upper Lip, Jeeves [page needed]; Bohumil Hrabal [Too Loud A Solitude], 1990 [page needed]. Film: Half-Wits Holiday, 1947 , The Rocky Horror Picture Show (1975), Escape from L.A. (1996). TV series: Burns Verkaufen der Kraftwerk, The Simpsons, 3 (11), 1991 ; Work Experience (The Office), The Office, 1 (2), 2001 ; Jumping the Shark, Reno 911!, 5 (1), 2008 ; Code Geass, 2 (24), 2008 ; K (anime), 2012 . Videogames: Damocles (1990), Tomb Raider (1996); MechWarrior 3 (1999); Max Payne 2: The Fall of Max Payne (2003); E.Y.E. : Divine Cybermancy (2011); Ryse: Son of Rome (2013). Music: Reed, Lou (1992), Sword of Damocles Externally ; Zealots, The Fugees and Wyclef Jean, 1996 ; Oh My Lord (Nick Cave song), Nick Cave and the Bad Seeds, 2001 ; Starblind, Iron Maiden, 2013 . 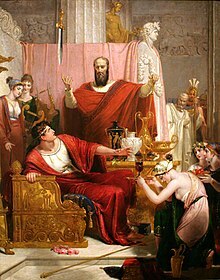 Look up sword of Damocles in Wiktionary, the free dictionary. Wikimedia Commons has media related to Sword of Damocles. Cicero, Tusculan Disputations (translation), Livius.org, V. 61 . Westall, Richard, The sword of Damocles (painting), Ackland Art Museum, UNC . This page was last edited on 22 February 2019, at 15:51 (UTC).